Post a flyer? Take a poll! The following opinion piece was written for this site by Todd Sutherland of Mississauga, Ontario. It proposes a bold and courageous act of legislation by the U.S. Congress that the Expansionist Party can enthusiastically back. Indeed, we'd be willing to enlarge the proposal to involve other areas as well, for instance Britain, Ireland, Australia, and New Zealand. Throughout most of the history of the world, states seeking to enlarge themselves typically did so at the expense of one another. Conquered areas became colonies, slave states, or even faced murderous depopulation. Even as civilized a state as Rome basically rolled over its neighbors one after the other, to the very limits of its power, and often beyond. But in one regard, the Romans were different from the other powers who came before them, and most who followed. As Rome spread its language and civilization to other lands, it began to extend the Roman franchise to the peoples it had once conquered. In this way, Rome came to command the loyalties of people far beyond the walls of that ancient city, and even beyond Italy itself. Rome survived as an entity for most of a millenium due in part to this policy. The Niagara Frontier. 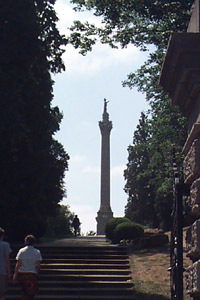 Taken from the observation deck of Brock's Monument in Queenston, Ontario. 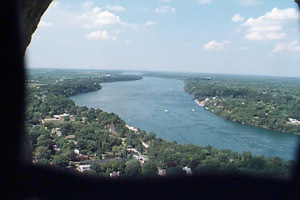 On the left and in the foreground, Ontario, Canada; and across the river on the right, New York, USA. In this modern age, politics, economics, and human rights have brought us, for the most part, beyond the age of conquest. Today, nations and peoples are coming together to bring down the barriers that hem us in, hobble our trade, and make us strangers across frontiers. We see in Europe the beginnings of a larger federation, a successor to the Roman Empire, the empires of Charlemagne and Napoleon  but this one built by the will of free peoples, working in concert with one another. A magnificent gamble that may pay off for hundreds of years to come. In our quarter of the world, we find ourselves faced with a situation that is at once much simpler, and yet more complicated. A unity of North Americans is an idea simplified by geography and politics  there are only two nations, with similar languages, cultures, and government systems involved  and yet, curiously complicated by the distance of history. Most US citizens don't conceive of the American Revolution as a civil war, but that is precisely what it was. Paul Revere did not cry "The British are coming! ", because he was British. Paul Revere called out to the Minutemen to warn them "the regulars"  meaning the army  were coming. 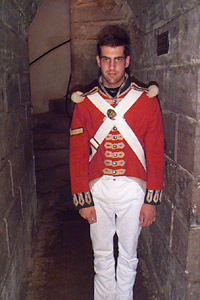 Startling as it may be to many US citizens today, thousands of Redcoats were in fact born on American soil. Samuel Adams once reckoned of the American Revolution that a third of the people supported it, a third opposed it, and the other third didn't care. As they would four score and seven years later in the Civil War, in the American Revolution, Americans fought and killed each other. Benjamin Franklin turned from his son William, the Loyalist governor of New Jersey, and never spoke to him again. The war divided Americans one from another, and at the end, those who opposed were forced to recant their opinions. Those who would not, headed north to the recently-conquered lands of New France, and founded Canada. And so it remains to this day. Courteous, but apart. The children of the same mother, who agree to disagree about the old lady's habits. The centuries have brought a blurring, a merging of sorts, of two people who never really were different peoples. One might be forgiven for thinking that a complete union between these countries would be simple. But the fact is, Canada remains to a large extent what it was; a nation founded in opposition to a nation founded in opposition. Canadians are the cousins and brothers and sisters of US citizens  figuratively and quite literally  but with the license that can only come of consanguinity, they look for and point out the little differences that separate them and give them meaning as a nation, so similar, so close to another that looks so much like home. And these are difficult habits to overcome. As for the people of the United States, was there ever one born who didn't secretly wish to sprinkle a few more stars across his flag? Was there ever a US schoolchild who looked at the map and didn't yearn to complete the work started in 1776? Deep in their hearts, most people in the United States think of Canadians as quirky kinsmen, people who belong with them; and think of the United States, as a result, as a land incomplete. Alaska, hanging off Canada into the Pacific, is the eloquent proof of that sentiment to anyone with eyes to see. And yet the Canadians remain quietly, oddly aloof. But if it's true that everyone in the US dreams of more stars, then it's equally true that Canadian children grow up wondering why they are, ever so slightly, the outsiders in their own culture. To grow up Canadian in the 1970s was to grow up watching Schoolhouse Rock, being stirred by the song they made of the Preamble, and then learning that it was not yours  in fact, that you were represented by the cartoon demons in scarlet uniforms being driven into the sea by pitchfork-wielding Patriots. Was there ever a Canadian born who, in his secret heart of hearts, didn't think of his country slipping away to join the US, something oh-so-obvious that somehow never came to pass? Like virgins of old in fear of their virtue, Canadians find new ways to fear the United States  something they've grown very good at  lest they indulge themselves in the wickedness of "what if" fantasies. They are like sailors who fear drowning in the smothering embrace of the sea, never realizing they were mermaids all along. 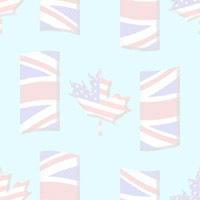 Canadians cling to their British heritage in large part because it provides them with an important means to differentiate themselves from the United States. Canadians, as things stand, will never come, cap in hand, begging to join. Canada is a viable, modern federal state, at least as it is, and there is simply not enough impetus to compel the bulk of Canadians to seek to join the United States. It's too much trouble for too little gain. Your neighbors may have a two-car garage and a swimming pool, but you'll visit them, not come knocking on their door asking to move in. But suppose your neighbor suddenly gave you the key? 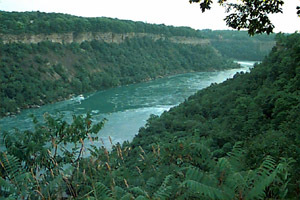 The beautiful Niagara River valley, at peace for nearly two hundred years (longer than the United States has been at peace with itself), and the pride of two countries. This is what I'm proposing. ...A magnificent gamble for the United States that, if it stays the course, it cannot lose. In Quebec, they call separatism "le beau risque"  the beautiful risk. I have a beautiful risk of union for the United States: give Canadians the key. "As of January 1, 2001, the government and agencies of the United States, and the states thereof, shall for all practical purposes, treat and regard the citizens of Canada as citizens of the United States." There is next to nothing that Canada, or the rest of the world, could do or say about this: it would come in the form of a gift, from the US to Canadians. After all, it's for the United States to decide who it will and will not consider citizens (Italians born in other countries can still be drafted into the service if they show up in Italy, for instance). And since it would not constitute the extraterritorial application of US laws, or the annexation of Canadian territory, no one in the UN or other nations could object. Canada would still be Canada. But the United States government would have succeeded in going over the heads of the Canadian government in extending this largess to the Canadian people themselves; one of the slickest coups in the history of the world. they would have to take the good with the bad). Canadians in trouble abroad could expect to receive help from US embassies. And Canadians would be legally entitled to move to the US, take up jobs and residence there, and vote in elections once they had lived there long enough to meet the residency requirements. This represents a risk for the United States, because, at least initially, it is very unlikely that the Canadian government would move to reciprocate. To do so would basically undermine Canada to the point that it would no longer exist, and would likely ruin the economy. And so, while Canadians were citizens in the US, US citizens would likely remain, for a time, welcome foreigners in Canada, as they are today. It would mean, for a time, slightly increased competition for jobs, as thousands of Canadians would attempt to exercise their newfound rights and try to find work in the US market. 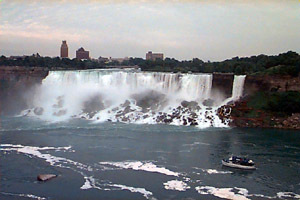 "American Falls", one half of the set of falls at Niagara. Ironically, these falls can only be properly photographed from Canada. 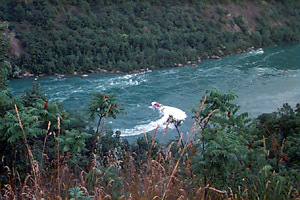 The boat in the right foreground is The Maid of the Mist II. For perhaps five, ten, or even twenty years, this unequal relationship would endure. The United States, the larger nation, would have to shoulder the inequity during this time. Naturally there would be grumbling and some resentment in the US. But as time passed, people in the US would gradually see the change in attitude. Canadians, now part of the US psychologically, would suddenly begin to think as US citizens. They would come to support and defend the US more than differ with it. They would have a vested interest in the future and well-being of the US that they do not have today, and people in the US would soon reap the harvest of the seeds they had sown. Rather than picking up and moving their homes, increasingly Canadians would consider picking up and moving their provinces, or the whole country, to the US. They would come to use the US dollar, increasingly, because it would be theirs. The pressure to normalize the relationship would build with each passing year. "If you want me to stay in Winnipeg, pay me the same dollar I'd make in Minneapolis." Or "Look how much lower the taxes are in Iowa. Can't we do something about that?" Canada and Canadian attitudes would melt down into the United States over the course of a generation as surely as butter over a warm flame. The United States Should Act, and Act Now... And Here's Why. Some US citizens might be reluctant to offer this gift to Canadians for no immediate return. If patriotism and generosity are insufficient to move them, they must come to see extending US citizenship to Canadians as an investment in the future. The US faces environmental challenges in the next several decades that beg the peaceful annexation of Canada. Or: to gain the resources as their own by "purchasing" them on the long-term lay-away plan  making Canadians US citizens. It is, for the United States, le beau risque. The wonderful gamble. The stakes are high, but the odds are stacked completely in favor of the house. If the US did this, it is virtually guaranteed that Canada, or at least most of Canada, would become part of the United States within a generation. It would be exactly like pulling the plug in the bathtub. There would be no turning back. The best part is, this is a ball the US can start rolling, that requires no cooperation from the Canadian government at all. In fact, there is no practical course Canada's government could take in this day and age that could seriously frustrate the plan. The United States would have spoken to Canadians directly, and Canadians, increasingly, would respond. There is every reason to do it. There is no reason not to do it. The Romans got it backwards. They made war and then made citizens of their conquests. The US can make citizens without conquest, and win a country without firing a shot  by letting Canadians discover what they've known all along, but could never admit. They want in. After 220 years, they want to come home. 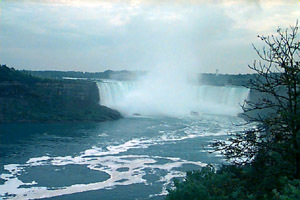 "Canadian (or Horseshoe) Falls", just south of American Falls. On the left is Goat Island, which is in New York; the border begins basically at the water. For generations this unparalleled beauty has filled the eyes of millions of young couples in what has become known as "The Honeymoon Capital of the World". Could this one day be the scene of the wedding of two countries? Check out a printable flyer with tear-off tabs for posting on bulletin boards. If you'd like to post this flyer in your area, please (a) fold back and forth several times on the line between the tab area and main text so that if someone rips off a tab a chunk of the message won't come off with it, (b) cut each tab free from the others, and (c) put it up only in legally permissible display areas, such as bulletin boards you are authorized to post to, public kiosks, etc.